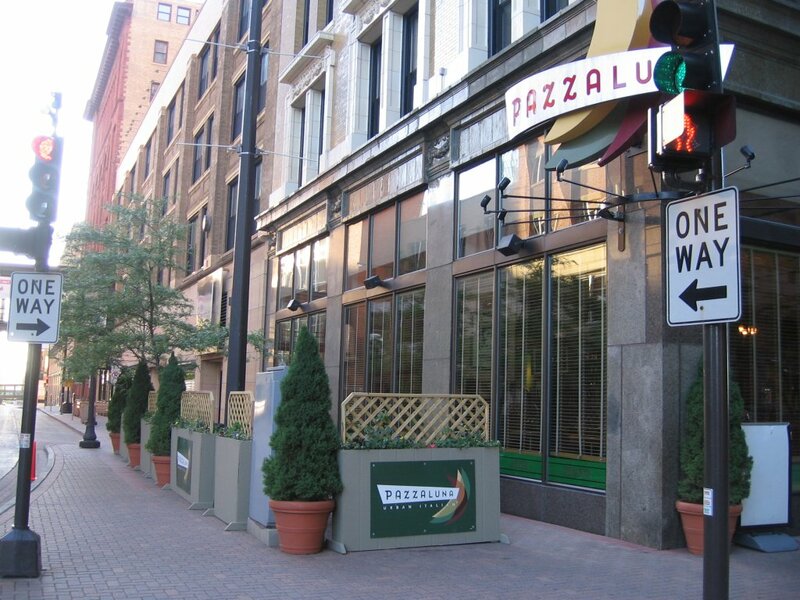 Whither the changes to the sidewalk dining ordinance? 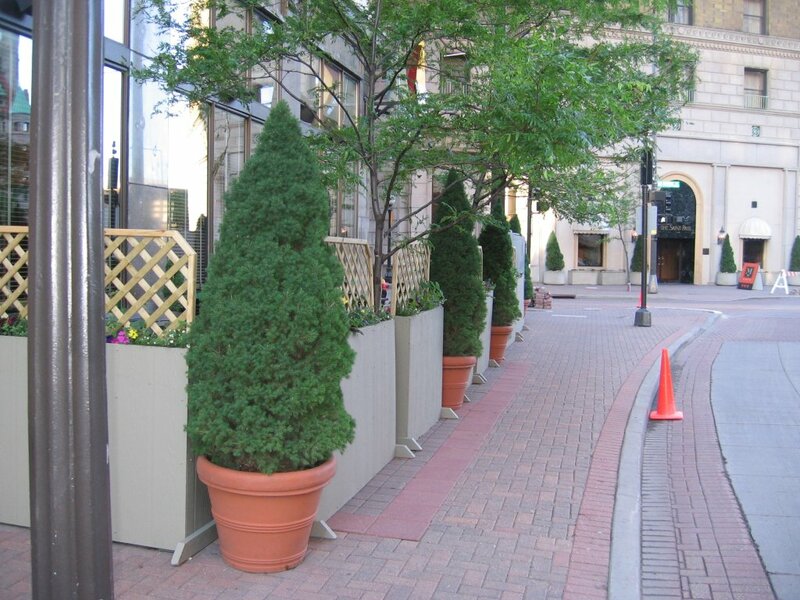 I was downtown St. Paul a couple of weeks ago and noticed the sidewalk dining structures on E. 5th St. between Wabasha and St. Peter. The width of the lane between the curb and the dining structures is less than 4 feet. I don’t know what code is. 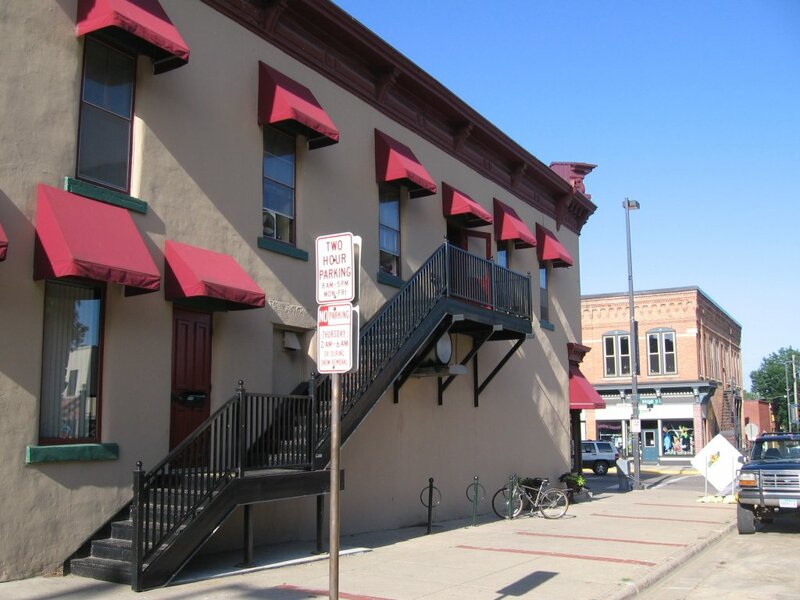 Robbie and I ate dinner last night on the sidewalk tables (left photo) in front of the James Gang HideAway but of course, we couldn’t have a beer or a glass of wine with our meal. Nor could the patrons down the street at Hogan Brothers. Nor the patrons up the street at the Rueb. Meanwhile, the Nlfd News reports quotes Rueb owner Joe Grundhoefer as saying, “We’re in the works of having a smoking patio built out back but we don’t know if it will be ready by fall.” I’d much rather see a sidewalk dining structure that smokers and non-smokers could share. There appears to be plenty of room for it on either the Division or 5th St. side of the building (photos below). So here we are, a year later, summer about to begin, and I don’t think anything has happened to move the ball along. With two and maybe three new restaurants opening this summer on Division (two serving liquor) it would seem that the time is right to have the ordinance changed. As I mentioned in today’s recording of the Locally Grown podcast (to be broadcast on KYMN radio for the first time, tomorrow at 5:30p, 1080AM! ), I asked City Attorney Maren Swanson for an update on the status of the “sidewalk dining” ordinances that were drafted in May 2005. She said that the proposed ordinance changes, which involve two zoning changes to the downtown district to allow for sidewalk sales, and one change to the liquor licensing law to expand the licensed premises to include adjacent outdoor/sidewalk areas, have been in the hands of City staff since last summer. When I asked Maren what the next steps should be, she suggested that the onus was on City staff and/or City Council to bring the issue forward again, and she said that the most appropriate and effective means might be to have the issue discussed at a City Council work session. So there you have it. Interested parties should contact their ward and at-large City Council representatives and lobby them to get this on the agenda before too much of the summer goes by. Thanks for the follow-up, Tracy. Let’s see if we can get Ross and the NDDC to bring this up with Ward 1 downtown Councilor Jim Pokorney. I have another followup. I spoke this morning with Brian O’Connell and asked about the status of the ordinance. His take on it was that there were a lot of issues regarding the administration of these ordinances, that their implications for use of public right-of-way were not limited to Division Street/ downtown, and at the time the ordinances were drafted the City and the Public Works dept in particular did not have adequate staff to support the ordinances if enacted. After being very patient with my sputtering and frustration about how, if other communities have found a way to do this, obviously we could too, Brian said he thinks that really it’s just been an issue that hasn’t been active because there hasn’t been the immediate need, political will, and/or lobbying to make it happen. When I asked specifically about a circumstance similar to Griff’s, e.g. 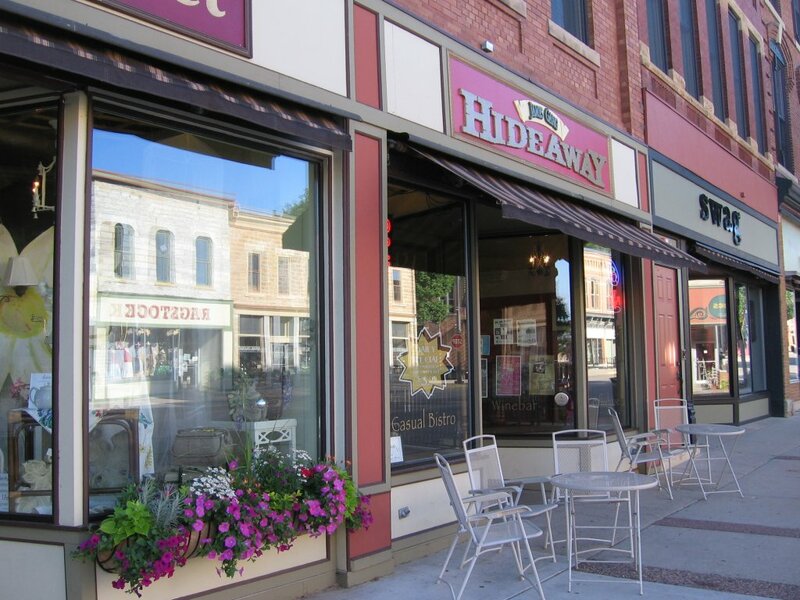 having a sandwich outside the Hideaway and wanting wine to go with it, Brian said that he thought (but wasn’t positive) that the liquor ordinance, extending the licensed premises, could possibly be done separately from the others. That would allow Griff to have wine with dinner, which is really what this is all about. Okay Griff, I’ll mention it to Jim (Ward 1) and Scott (Ward 2) tonight at dinner. Maybe I’ll try to get them to step outside the Grand with their drinks in hand and discuss ordinances on the sidewalk. Does “temporary” cover the, let’s say, 5 months of outside ordinance opportunity in Minnesota? …oh, and does the application process take 3 of the 5 months of opportunity? I’d like to see the entire text of the Dundas ordinance, since there are misc. issues like pedestrian/wheelchair access, physical boundary markers, fines, use of tables and chairs by non-patrons, ability to use a portion of the street, etc. I talked to Councilor Jim Pokorney about this issue yesterday and he thought that if the NDDC would draft the ordinance, he’d carry it to the Council for consideration/staff input. (g)	Seasonal outside service areas. The council may, by resolution, permit any licensee to sell or serve intoxicating liquors in areas outside the building structure which are immediately adjacent to and contiguous with the structure containing the licensed premises, or on property leased or owned by the licensee which is within forty-five (45) feet of the property line of the licensed premises. Property which is not connected to the licensed premises cannot be used as an outside service area if it is located across a right of way such as a street or alley. Such outside service areas shall be seasonal, and shall not involve an enlargement of the building structure. Such permission shall not be granted unless all the conditions of subsections (1) through (7) and all pertinent provisions of the zoning code are satisfied. (1)	No outside service area shall be permitted unless the licensee presents with his or her application for such outside service area a statement in writing by ninety (90) percent of the owners of all private residences, dwellings and apartment houses located within three hundred (300) feet of the proposed outside service area that they have no objection to such service area. Measurements shall be determined from the property line of the licensed premises to the property line of the residential uses; provided, however, that where the licensed premises is located within a shopping mall or shopping center the measurements shall be determined from the nearest corner of the building in which the licensed premises is located to the property line of the residential uses. (2)	Off-street parking spaces may not be reduced by the establishment of an outside service area below the number of off-street parking spaces which would be required if the licensed premises together with the outside service area were to be newly constructed in conformity with the zoning code; provided, however, that this requirement may be modified by the council by resolution in accordance with the procedures and substantive criteria provided in section 409.08(11)e. of this Legislative Code. (3)	No outside service area shall be permitted unless the licensee provides, in addition to other requirements of law, safety barriers or other enclosures to protect patrons from any hazards, including vehicular traffic. (4)	No outside service area shall be located on public property or upon any street, alley or sidewalk, nor shall such outside service areas hinder or obstruct vehicular or pedestrian traffic on any street, alley or sidewalk. Notwithstanding the foregoing, the sale and service of alcoholic beverages within a sidewalk cafe by a food establishment which is licensed as a restaurant under Chapter 331A of the Legislative Code and which is in compliance with the provisions of section 106.01 of the Legislative Code, is permitted. g.	Any other condition inconsistent with the reasonable use and enjoyment of adjoining property and inconsistent with the health, safety, morals and general welfare of the adjoining neighbors or community. (6)	Permission to sell and serve intoxicating liquor in or upon any outside service area may be revoked by the council on three (3) days’ notice to the licensee, pursuant to information received at a public hearing before said council. The information need not be received under oath, but must reasonably satisfy the council as to the existence of any or all of the conditions listed in subparagraph (5). The public hearing shall be conducted with such formal or informal procedures as the council may permit, so long as the licensee and any complaining parties have an opportunity to be heard. (7)	The licensee shall, with respect to any outside service area, comply with all applicable provisions of law and regulations in regard to the sale and service of intoxicating liquor, including, without limitation by reason of this specification, all applicable regulations contained in sections 409.08 and 409.09 of this chapter. *Cross references: Short-term permit for selling food or drink, § 188.110 et seq. 265.280. Authorized; permit required. (a) Any licensee under Chapter 188, 362 or 366 of this Code who is licensed to sell food, beer or liquor for consumption on designated premises may apply to the city council by and through the department of licenses and consumer services for a special permit to conduct a portion of such licensed business in a sidewalk cafe on a part of the public way immediately adjoining the licensed premises. Such permit shall be valid for one year from the date of council approval. 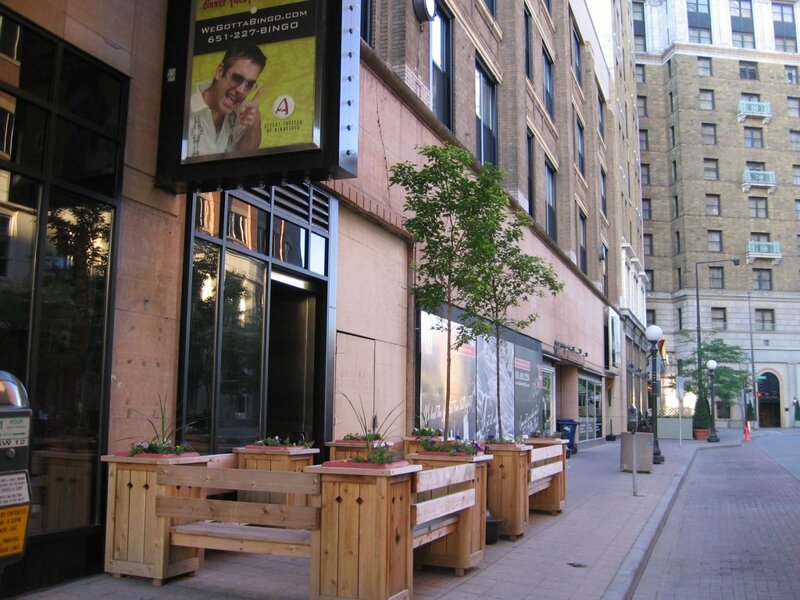 Cross references: Sidewalk cafes permitted on Nicollet Mall, § 439.20(h). 265.290. Restrictions. (a) Each permit issued pursuant to this article shall specify the area in which such cafe may be operated; provided that no sale or service shall be permitted in any portion of the street designated for vehicular travel. (b) Issuance of a permit shall not be construed as authorizing any permanent installation to be placed in the public way. (c) No such permit shall authorize the placing or leaving on the sidewalk of any tables, chairs, furnishings or other equipment during any periods of time such sidewalk cafe is not open and being operated, except that this subsection shall not apply to any establishment located in the Central Commercial District as defined in section 360.10 or in the Lake and Hennepin PO Overlay District as defined in section 551.150 of this Code. (d) No such permit shall authorize a sidewalk cafe at any location where the same is prohibited by state law, or this Code of Ordinances, except as herein provided. 265.300. Procedure for new permits. (a) An applicant for a permit under this article shall file an application therefor on forms provided by the director of licenses and consumer services. In addition to any other information required by said director, the application shall include evidence that notification of the application has been mailed or delivered to the ward council member, the neighborhood group(s), and the business association(s), if any, for the area in which the premises is located. The neighborhood group(s) and the business association(s) to be notified are those organizations that appear on a list maintained by the planning department for this purpose. Where the premises for which the license is sought is located on a public street that acts as a boundary between two or more such neighborhood or business organizations, the notification shall be provided to the organizations that repre sent the adjacent area(s). The notification shall include the following information: the type of license applied for; the address of the premises for which the license is sought; and the applicant’s name, address and telephone number. (b) Upon the filing of the application the director of licenses and consumer services shall refer the application to its standing committee on licenses for consideration and the conduct of a hearing thereon. The director of licenses and consumer services shall notify by mail all residents, to the extent such notice is feasible, and property owners within three hundred (300) feet of the proposed sidewalk cafe of the time and place at which such application shall be considered by the committee. Said notice shallgo to all owners of record of property as identified in the records of the Hennepin County Department of Property Taxation. The director shall also notify the appropriate neighborhood group(s) and business association(s) of the time and place of the hearing. (c) The director of licenses and consumer services shall also notify the director of public works, the police license inspector and the commissioner of health of such application, and they shall each report to the committee and make such recommendation as they deem appropriate. 265.310. Insurance.No permit authorized by this article shall be effective until the applicant therefor has filed with the director of licenses and consumer services evidence of insurance insuring the applicant against liability imposed by law arising out of the ownership, maintenance or operation of such sidewalk cafe in amounts of at least fifty thousand dollars ($50,000.00) for the injury or death of one person, three hundred thousand dollars ($300,000.00) for the injury or death of two (2) or more persons, and ten thousand dollars ($10,000.00) for damage to property. The city shall be named as an additional named insured in the policy providing such insurance, and such policy shall further provide that it may not be canceled except upon ten (10) days’ written notice filed with the director of licenses and consumer services. 265.320. Permit suspension and revocation. (a) Any special permit authorized by this article may be revoked at any time by the city council. Any such permit may be suspended by the city council for such period as the council shall determine. 265.330. Permit fees. (a) Each year at the time of filing the application for such a permit, the applicant shall pay to the city finance officer a sum as established in Appendix J, License Fee Schedule. The City codes are available at the City hall. They do address the stuff Griff asked about. As I said, they were originally drafted for Northfield, Dundas just edited them to apply to Dundas’s situation. Ross, I don’t know if application takes long to process, so I can’t say if a business actually has to plan a long time in advance to use this. We only have one or two businesses right now that would appear to have any interest anyway. Jim Pokorney has asked the NDDC to propose language for an Ordinance. The E R Team has drafted some language and the Board will review it this afternoon. The draft has also been forwarded to the three restauranteurs that expressed interest at last year’s Forum. Your links to Minneapolis and St. Paul were interesting and provided some grist for our mill. Thanks for reviving this topic. …how about some kind of an ‘overlay’ for the ‘Olde Town’ area which would define particular permitted activities such as outdoor dining/drinking…this ‘overlay’ could have specific language such as ‘loud, boisterous or disturbing noise levels’, and ‘hours’, and ‘permission from private residences’, and deal specifically with the riverwalk, its approaches, alleys, max area of permitted space, etc. Question: where are the enforcement standards (such as reasonable use and enjoyment) and is this a ‘drive-by’ policing concept? ; ‘response to complaint’ process?, or ‘foot/bike patrol oversight/policing’ concept?… (and where is the law enforcement budget)? Observation: Is the proposed language ‘There shall be outside dining in Northfield’ a serious statement indicating the NDDC’s attitude towards dialogue? Surely, the NDDC, besides presenting the ER Teams’s input, is open to considering all sides of this issue? Long term, it might be interesting to tackle the complications/benefits of ‘permitting’ the carrying and consuming in non-glass containers, wine/beer out onto the Arts Town sidewalk/public space immediately contiguous to a non-licensed’ art gallery…? Great to hear, Ross. I’ll be thrilled to be the first to buy you a drink and have it delivered on a public sidewalk. Dean, I think Jim Pokorney’s philosophy on this, and it’s one I share, is that let’s take our best whack at an ordinance revamp with the expectation that it’ll need ongoing fine-tuning for a while based on experiences/unexpected consequences until we get it right. 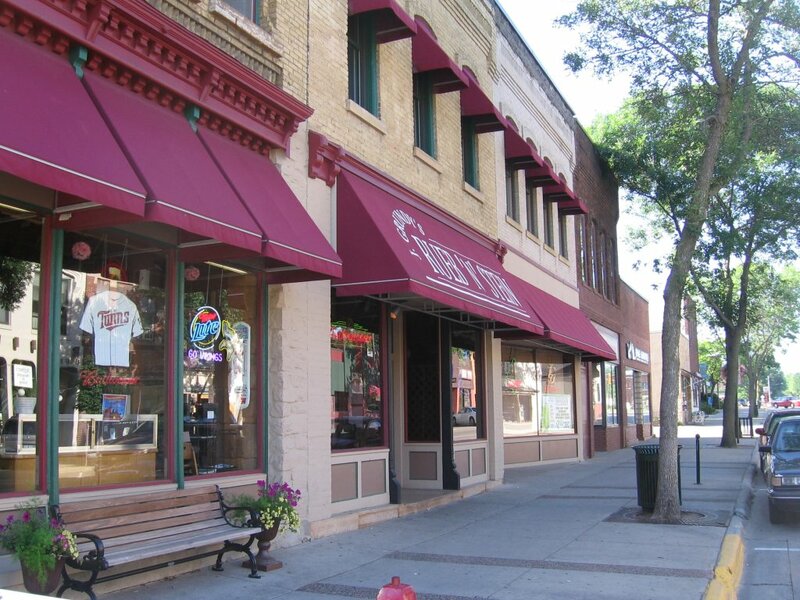 Pingback: Northfield Downtown Development Corporation » Weblog » Rehearsing Outside Dining?